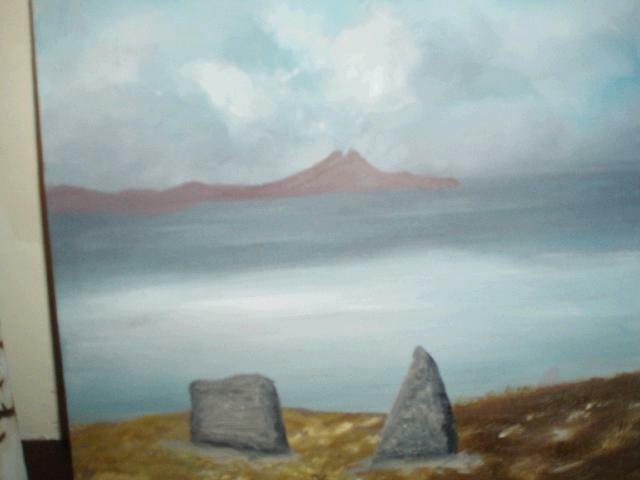 The Radhairc Iorrais exhibition of paintings by Barbara Heneghan opened on the 6 Oct 2009 in the Gno Muigheo offices in Westport, as part of the Westport Art's Festival. 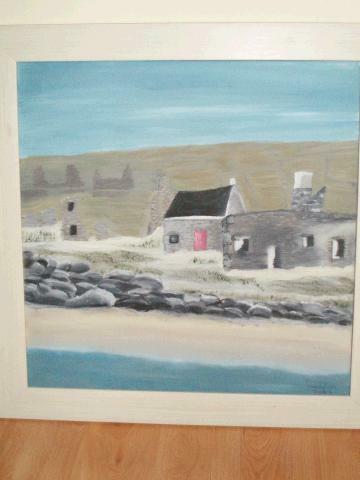 The exhibition will run until the end of October 2009 and is titled “Radhairc Iorrais” it depicts scenes from the Erris area some of which are shown below. Radhairc Iorrais "Tá an taispeántas seo bunaithe ar radharcanna Iorrais. Tógadh in Iorras mé, áit deas, iargúltas le radharcanna álainn agus oidhreacht láidir. An rud is fearr liom faoi Iorras ná an fharraige agus an aimsir, athraíonn an aimsir go minic agus go tapaidh i rith an lae, agus gach uair a athraíonn an aimsir tagann dath difriúl ar an bhfarraige, an spéir agus na hoileáin, sin an rud a dhéanaim iarracha léiriú i mo phictiúir." Dearbhla’s Twist: Seo leacht a tógadh i 1997 d’fhéile Mayo 5000. Tá sé déanta suas de 20 carraig saorsheasaimh agus tá cosúlacht súile air ón spéir. This is one of the Mayo Sculpture trail monuments. It consists of approximately 20 free standing rocks. The formation takes on the shape on an eye from the sky. Tithe Inis Gé/ Houses of Iniskea: Is iad seo na tithe a d’fhág muintir na hoileán i 1937. Sa phictiúr seo tá ceann de na tithe a rinneadh athchóiriú air i rith an Tíogar Ceilteach. These are some of the houses the islanders left in 1937, in this picture we can see one house that was refurbished during the Celtic Tiger. 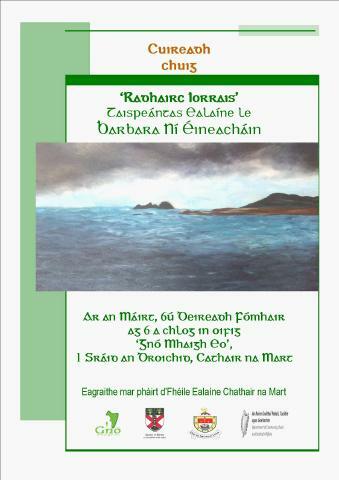 An Báthadh Mór/ The Big Drowning. Seo véarsa d’amhrán a scríobh Riocard Bairéad, ceann de na filí is cáiliúla as Iorras. Is amhrán faoi oíche a tharla stoirm mhór i 1937 é seo. Cailleadh deichniúr fir as Inis Gé an lá sin. Tar éis na stoirme d’fhág muintir Inis Gé an tOileán agus bhog siad go dtí an mórthír. 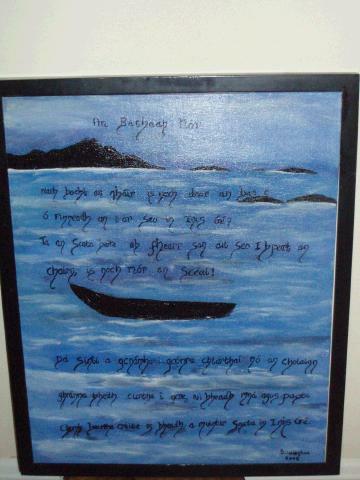 The first verse of the song "An Báthadh Mór" which was written by local famous poet Riocard Bairéad. The song is about a storm in 1937 when 10 men from the Iniskea islands were drowned , shortly afterwards the islanders left the island to settle on the mainland. Túr Dubh Oileán Túr Dubh Oileán: Is carraig mhór í san Atlantach, bíonn an fharraige an-gharbh thart ar an áit seo i gcónaí. 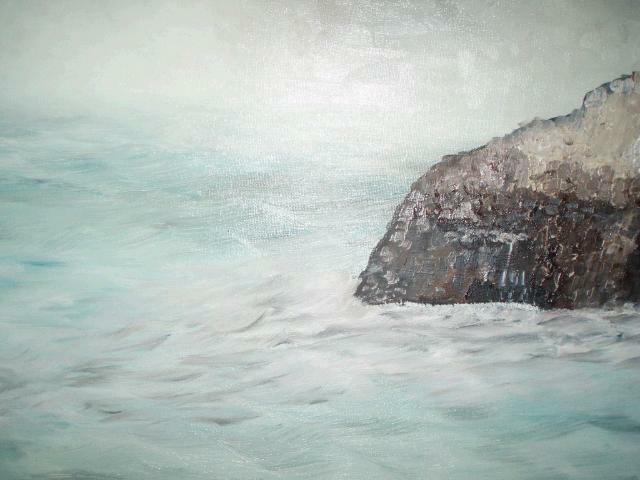 Túr Dubh oilean, this is a large rock in the Atlantic near Blackrock there are always rough seas here. 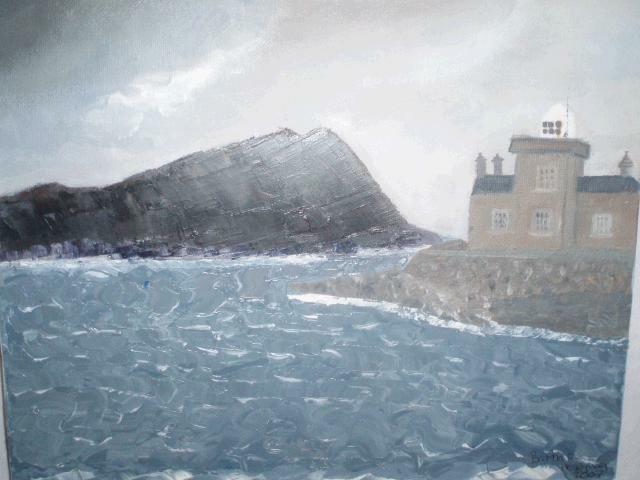 An Túr/ Balckrock Lighthouse Seo pictiúr den teach solais ar an gCarraig Dubh "An Túr". Chaith m’athair seal ag obair sa teach solais seo agus deirtear gurb áit an-uaigneach é atá plódaithe le taibhsí. 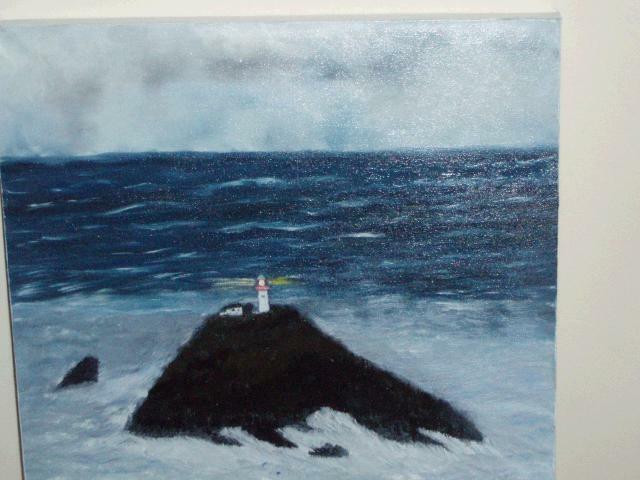 This picture is of Balckrock Lighthouse. My father spent some time here as a lighthouse keeper and it was known among Lighthouse keepers to be a lonely place with plenty of ghosts. Dún Briste: Seo pictiúr de staca farraige i gCéide atá suite amach ó chósta Mhaigh Eo. Is áit chiúin é ach bíonn sé garbh ann de ghnáth. Cuirim béim ar chiúnas na háite sa phictiúr seo. 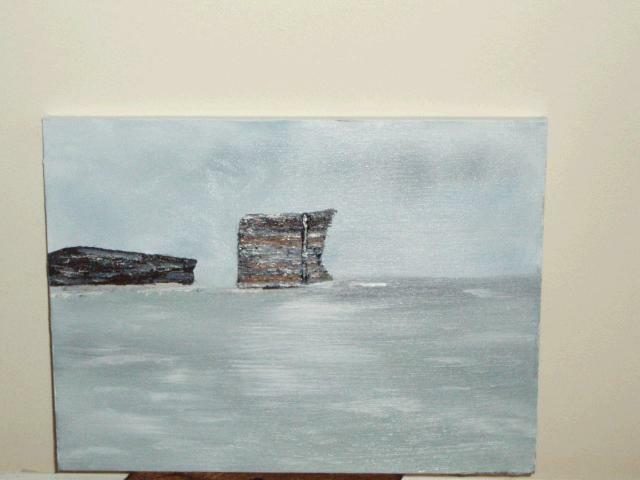 A sea stack off the North Mayo Coast in Céide. This is a quiet place; however there is usually rough sea’s here. 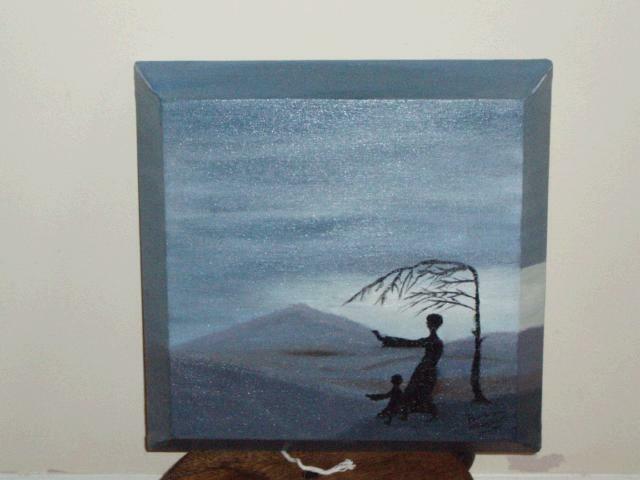 In this painting I tried to capture the calm and quiet of the area. Teach Solas an Fhóid Dúbh: Seo pictiúr den Teach Solas an Fhóid Dubh. This picture is of Blacksod Lighthouse.